This is a super easy veg pulao & can be prepared in minutes. Most often prepared for lunch box at my home. It goes well it any spicy curry. I often prepare this with Kadai Paneer, Kadai Mushroom, Paneer Butter Masala ...etc along with Onion raitha. Some time I eat this pulao simply with out any combo dishes. Its really tasty and also an easy to prepare one pot meal. 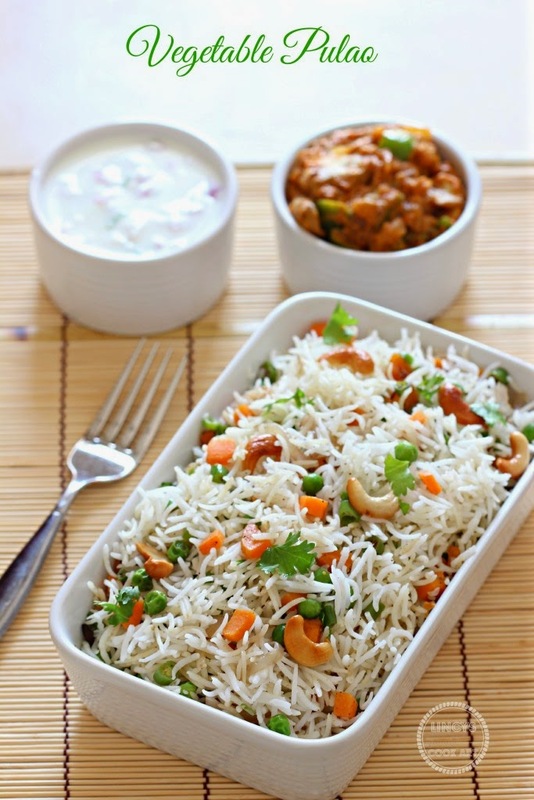 I prepare this pulao similar to fried rice using Indian spices in a quick and easy way. Kids too love this pulao as it is mild in spice and so flavourful. You can prepare this for simple lunch box to party treats. It hardly takes time and you can able to finish this dish in 20 -30 minutes. You could add capsicum and sweet corn too in this pulao. Half cook the rice with salt and enough water then drain the excess water. Spread the rice over a broad plate and allow to cool (or) Cook 1 cup of rice with exactly 1.5 cups of water and fluff the rice with fork. Heat oil in a pan and add jeera when you get the aroma add the cinnamon bark, clove and cardamom and fry for fifteen seconds. Now add the chopped onion and pinch of salt. Cook till soft. Add the ginger garlic paste and cook for thirty seconds till the raw flavour leaves. Add the chopped veggies carrot and beans and saute in that oil for fifteen seconds. Now add the thawed frozen peas (keep few minutes inside normal water to thaw instantly) or precook fresh peas with sugar and salt. If you need to cook the veggies soft sprinkle little water and close with a lid to cook the veggies soft for thirty seconds. Other wise stir fry the veggies in oil. Add the pepper powder and garam masala powder; mix well and cook for fifteen seconds. Now add the cooked rice and mix well; add salt if needed. Add the chopped coriander leaves and switch of the gas. Heat ghee in a pan and roast the cashew nuts till golden brown. Pour this on top of pulao and mix well. Note:You could add capsicum and sweet corn too in this pulao. Veggie combination is upto your taste. Pulao looks very delicious and inviting!! Never heard of pulao before.. definitely delicious and perfect for a weeknight dinner. Thanks for the great recipe!